Can You Catch Bass Under Ice? Crosslake, MN – A certain notion says bass don’t much care for the cold. That when winter arrives and seals lakes with ice, big green and brown bass skulk about, but certainly don’t care to bite. Well, the actual truth is, a small group of exploratory anglers in Minnesota and Ontario have been quietly going about the business of bassin’ through augered holes in frozen lake surfaces. They’ve lipped plenty of largemouth and smallmouth bass. Big ones, too. But perhaps more importantly, the exploratory anglers have proved a few notions of their own, thanks largely to underwater optics documenting the antics of frigid water bass. Mike Hehner, photographer and producer for Brainerd, Minnesota based Lindner Media Productions has been on the forefront of the hardwater bass movement. Hehner, as well as Ontario angler Aaron Wiebe, believe winter bass are worthy of more angling attention due to the species’ sporting qualities. But both anglers also beg for careful conservation, catch-and-release and selective harvest of small specimens only. Debunking and perhaps confirming long-held conceptions in equal measure, Hehner reveals some of his more surprising underwater discoveries, and offers a few suggestions. Just as in summer, bass exhibit different moods on different days. Immediately release all bass in extra cold temperatures (below about 20oF.) In lakes with ample populations of small and medium size bass, consider harvesting some fish less than 15-inches, while recycling all larger bass. Big bass willingly bite panfish-size plastics. One to 2.5-inch worm-like baits on small tungsten jigs work very well. “One of the best baits is a live 3- to 5-inch shiner minnow tethered to a #1 wide gap hook. We’ve found it’s best to restrict the minnow’s movement by anchoring it slightly in place with split shot. If the minnow gets too wild, bass can lose interest and stop chasing. Creator of Aqua-Vu, the original Underwater Viewing System, Outdoors Insight, Inc. has led the underwater camera category in design, innovation and quality since 1997. The Central Minnesota based company builds many popular outdoors products, such as the iBall Trailer Hitch Camera (iballhitchcam.com) and Odor Check Moisture and Odor Control System (odorcheck.com) featuring Scent-Lok Technology. For more information on Aqua-Vu, visit www.aquavu.com. This entry was posted in Ice Fishing on February 28, 2019 by ronniegarrison. Have You Ever Caught A Tagged Fish? Ever catch a tagged fish and wonder what it’s all about? N.C. Division of Marine Fisheries researchers are tagging more than 15,000 striped bass, red drum, southern flounder, spotted seatrout, and cobia per year. Reporting a tagged fish is one of the easiest and best ways to get involved and to do your part to help manage North Carolina’s fish resources, while putting cash in your pocket. Tagging animals has long been a method for monitoring wildlife. Fish, ducks, birds, black bears, grizzly bears, deer, monarch butterflies, to name a few, are tagged for different management purposes. Although the look, size, and location of tags may differ, the overall purpose is to gain insight into stock identity, abundance, age, growth, movements, migration, mortality, or behavior. So why do fisheries managers use tagging, and why is tagging such an important tool in the fisheries management tackle box? Because it works. Unlike other animals, fish spend almost their entire lives out of sight of the researchers who are trying to learn about them, which makes studying them difficult, time consuming, and usually costly. For instance, to manage any of our state species, researchers need to know what stocks are mixing and when or where they’re migrating. Without tagging studies, researchers would have to rely on long-term surveys or word of mouth, and they would never know the finer details of movements, migrations, and population mixing that tagging data can afford. Likewise, for completing stock assessments, fisheries managers need accurate and timely information on mortality, stock delineation, growth, and more. Tagging studies are a great tool in the tackle box because they’re a cost-effective approach to gain this information, and the results are available quickly compared to long-term surveys and studies. How are tagging data used in a stock assessment? Stock assessments are sophisticated statistical computer models and simulations of fish populations that require three primary categories of information: catch, abundance, and biology. To ensure the highest quality stock assessments, the data used must be accurate and timely. Combining the cost-effective and timely tag-return data with the catch-at-age data currently collected by the division is a powerful, cutting edge approach to improve estimates of mortality and population size compared to traditional age-structured computer models alone. Combining these data allow for greater accuracy in estimates of stock status and allow for more informed and responsive management of North Carolina’s fisheries. How can you have an impact in fisheries management? The division needs your tagged fish data. It is only through the cooperation of the recreational and commercial fishermen returning tag and species information that the division collects the data necessary for the program to succeed. By returning information about your tagged fish, you’re directly impacting the accurateness and effectiveness of fisheries management. For instance, by returning information about the tagged fish that you caught, the division learns information such as how far and where the fish traveled, which gives information about movements and migrations. 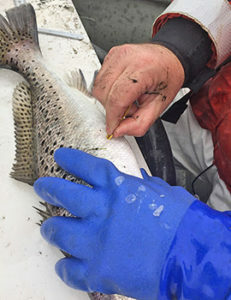 Measuring your fish gives us accurate, real-time growth information and lets us learn more about the biology of the species; and letting us know if you harvested or released the fish, helps us better understand both the harvest and catch-and-release fisheries, which is an important factor in stock assessments. So, if you want to help better and more accurately manage North Carolina’s fisheries, don’t forget to return your tagged fish data. What do you do if you catch a tagged fish? The division doesn’t ask you to change your catch behavior. The division simply encouragew all anglers who encounter a NCDMF tagged fish to return the tag or tag number and ancillary information to the division. Please cut off the tag(s), then write down the tag number, catch date, whether the fish was harvested or released, capture location (waterbody or nearest landmark) and total length of the fish. Save the tag and other information and call the division at 800-682-2632 or report the tag online. Those who return red tags to the division with the catch information will receive a $100 reward. Those returning yellow tags will receive a hat, $5, or other reward. A letter will also be mailed to anyone returning tags, stating where and when the tagged fish was released, days at large, distance traveled, and the length of the fish when it was released. Finally, all tag returns are entered for a division end-of-year cash drawing. *Cut off the tag, do not pull it out. *If you are releasing the fish, cut the tag as close to the body of the fish as possible. *Record the tag number in case you misplace the tag before reporting it. *If the tag has algae growth, do not scrape the algae off. Scraping the algae can lead to tag damage that inhibits the division from recognizing what fish it came from. If you come across algae growth on the tag, either send the tag to the N.C. Division of Marine Fisheries or let the tag soak in soapy warm water until the algae comes off. *Be careful when handling fish you intend to release. Handle it as little as possible, using wet hands or wet gloves. Return the fish to the water quickly to give the fish the greatest chance of post-release survival. *Be alert! Tags are designed to be as unobtrusive as possible, so they don’t change the fish’s behavior. That means that you might not see one if you’re not looking. Please report all tag and species information to the N.C. Division of Marine Fisheries. *Some fish will have two tags, so check both sides of the fish and report both tags. This entry was posted in Conservation on February 26, 2019 by ronniegarrison. Last Saturday,24 members of the Potato Creek Bassmasters fished our February tournament at West Point. After eight hours of casting, we brought 68 keeper bass weighing about 104 pounds to the scales. There were nine five-fish limits and six members did not land a keeper. Cox was second with five at 8.51 pounds, Doug Acree placed third with five at 8.27 pounds and Dan Dupree came in fourth with five at 8.10 pounds. I had fun catching them most bass I have caught in months although the day did not start that way. We put in at Pyne Park where tournaments are held every weekend. Since released fish restock that area constantly, I started fishing near the ramp. A short spot hit my crankbait soon after starting and I got two more bites on it I missed, so I felt I was using the right bait. But then I got a bite on a shaky head worm and my line broke near may reel when I set the hook. That I a stupid mistake. Using a baitcast reel, if you get a loop in your line and don’t get it out, the next cast will cause the line to burn against the reel and weaken it. I am sure that is what happened. I lost so much line I had to sit down and respool that reel, filling it with 14-pound test line. Soon after that I caught a keeper spot on the crankbait but at 11:00, after fishing several places near the ramp, I had not caught another fish. I decided to go to another creek where I had found a small drop with rocks on it that usually hold fish. As I entered the creek, I saw a boat fishing near it so changed to my next stop, a rocky point in another creek. But there was a boat fishing there, too. I am glad that happened. I went to my third choice, another rocky point in another creek. On a rock ridge that runs off it I quickly started catching bass. They were all small and mostly just keeper spots, not weighing much but fun to catch. I stayed on it for over two hours and landed 14 bass, including a keeper largemouth and several short fish. But I had my limit. I probably stayed on it too long having fun, but I did catch two decent size fish and kept hoping bigger ones would move up as the sun warmed the water. And I was having fun. The most frustrating thing was I broke my line setting the hook three times. I tried to check it after every cast since I knew the head bumping the rocks would fray it, but I was not careful enough. The worst was when I pitched the shaky head to a stump barely visible under the water. A fish picked it up without a hard thump and started swimming toward the boat, often a sign of a bigger bass. I didn’t have much line out and when I set the hook the fish did not move, but then my line popped. I will never know how big it was. With a little over an hour left I decided to try something else and with just 15 minutes left I caught my biggest fish of the day, a largemouth weighing just over two pounds. It hit on a small rocky point back in a cove. I ended up with 7.76 pounds, fifth place but not quite enough. This entry was posted in Bass Fishing, Tournament Fishing on February 25, 2019 by ronniegarrison. For most anglers grass means one thing: the long, skinny green stuff that grows in shallow waters. In fresh waters we often call it tape grass; in salt water we go with sea grass. In a healthy estuary, you are likely to encounter both if you are on the move. One of the primary sources of habitat for estuarine fishing is grass. And Florida, to be sure, has lost scads of tape grass and seagrass around the state, from as far north as the Mosquito Lagoon to as far south as Florida Bay and the Everglades. When talking about all types of grasses, scientists refer to them as Submerged Aquatic Vegetation, or SAV. And the loss of SAVis not just a Florida issue. It’s been estimated that we’re losing two football fields of SAV an hour world-wide, which equates to 7 percent a year. Mountains of information have been written about the loss of habitat, who’s to blame and why. That debate will continue forever. But there’s one thing we can all agree upon. These grasses are important to fishermen and non-fishermen. Estuaries are vulnerable to erosion. Florida, if you recall, has been hit by two hurricanes during the past two years — Matthew in 2016 and Irma in 2017. I got a first-hand introduction to both storms and the importance of how ecology works to benefit us. I lived on St. Augustine beach and the only thing that saved my house from Matthew’s flooding were the formidable dunes that were held together by sea oats. Not exactly submerged grass, I know, but the point about protection holds true. A similar scenario evolved nearly a year later when Irma passed over North Florida. I currently live in High Springs, not far from the banks of the Santa Fe River, which has an abundance of grasses. The river sustained record flooding that washed away low-lying houses. However, the river bottom and surrounding remains largely intact, thanks to the meadows of eel and tape grass. After weeks of high water, the fishing returned to normal, proving that nature can indeed heal itself. Remember that big fish you caught? Maybe it was a bass? Maybe it was a redfish? Or a seatrout? Chances are, that fish used seagrass as a nursery for a couple years. 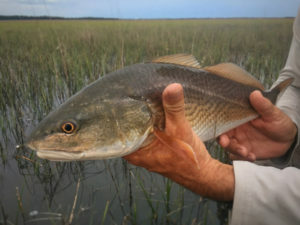 A female redfish produces millions of eggs. Those eggs will become larvae and only a fraction of the larvae live long enough to become juveniles and those fish lucky enough to reach that stage head for the sanctuary of the seagrass, where they will use every nook and cranny for food and protection. The standard length or a year-old redfish is a foot. And a fish that size will feed on crabs and shrimp and maybe a few small forage fish. A three-year old can weigh 6-8 pounds. The diet remains largely the same, and guess where you can find crabs, shrimp and forage fish? In the seagrass. Fish aren’t the only ones that use seagrass for food. Manatees, geese and turtles and other grazers feed off underwater vegetation. One acre of seagrass can support thousands of fish and millions of invertebrates. All are looking for their next meal. According to the Smithsonian, a green sea turtle can eat as much as 4.5 pounds of seagrass a day. Other grazers don’t eat the leaves directly but nevertheless feed off them. Snails and worms, for instance, clean the grass by eating the algae, which generates seagrass growth and it serves as a form of protection from local urban runoff, which often produces algae. Underwater grass cleans the water by capturing sediments and particles which, without the filtering effect of SAVs would make sight fishing darned near impossible. Let’s take Tampa Bay, example. Because of the abundance of turtle grass and shoal grass in the Bay area, you can sight fish for reds year round. On the other side of the clarity equation is the Treasure Coast. Try finding clear enough water for reds near Stuart and Jupiter. Chances are, you won’t. The reason: Very little seagrass these days — or oyster beds for that matter. SAVs also contribute our quality of life above the water’s surface by oxygenating the water column and storing carbon. According to EurekAlert, global coastal wetlands can capture and store 200 metric tons of carbon each year; one acre of seagrass is capable of harboring 740 pounds of carbon, attributes that can provide balance in the atmosphere. The beauty of fishing is that there’s always something to learn. Nature is a great teacher. We all want to catch more fish, and the best thing that an angler can do to reach that goal is to study the fish’s habitat. Learn it. Cherish it. Protect it. The future of fishing depends on it. Editor’s note: Mike’s story about SAVs is Part 1 of a series that will highlight the importance of grasses, and lead into information about SGF’s $1million dollar SAV restoration project which has started in the Caloosahatchee River, where we are working with Sea & Shoreline and Johnson Engineering. Stay tuned! Photo credits: Redfish image courtesy of Tim Boothe. All other images courtesy of FWC. To learn more about the Angler Action Foundation, visit www.angleractionfoundation.com. This entry was posted in How To Fish on February 23, 2019 by ronniegarrison. There is something starkly beautiful about the woods and lakes in winter. Bare trees are not nearly as pretty as they are in the fall with colorful leaves or in spring with bright fresh green leaves, but they do have an allure all their own. Even the wind sounds different. Rather than the dry rustling of fall leaves or the swooshing sound of green leaves blowing in the wind, this time of year the bare branches make a mournful howling sound. At night it can be even more spooky. The sky looks different, too. The moon and stars are bright and hard in the cold air rather than the fuzzy twinkling light shining through layers of warm, moist air. And bare trees mean you can see them even better. On the lake, the water seems to either be a steel gray cold or orange mud cloud. Neither are inviting as the warm hues of summer. No one wants to jump in the water in winter, unless you have a desire to join the Coney Island Polar Bear Club. Instead of the enjoyable cooling splashing of summer it is a dangerous hypothermia inducing cold. It is still fun to be outdoors this time of year. There is time to roam the fields and hedgerows to find quail and rabbits before seasons end. Tree rats stand out as they scurry around in bare branches and are easier to spot, but harder to stalk since they can see you easily, too. Some folks like to walk deer trails and bedding areas looking for antler sheds. Bucks around here usually start shedding their antlers in early January and continue until March, so now is a good time to find them. Whitetail bucks are amazing. They start growing their antlers in the spring and they grow until late summer. As they grow they are covered with a layer of soft, blood rich material called “velvet” that supplies the antlers with nutrition to grow. In the last summer this material starts to die and the bucks rub it off to polish their antlers. The antlers stay hard and strong, firmly attached to the deer’s head, until the end of breeding season. They then fall off and the buck starts the cycle again in a few months. You must be quick to find shed antlers. Squirrels and mice love to eat them for the nutrients they contain, so if you do not find then within a few days of being shed you are likely to find gnawed remains or nothing at all. Fishing in the winter can be great, especially for big bass. Crappie feed well, too. You can catch large numbers of crappie suspended over deep water when you find a school of them, and bass also school up in deep water where you can catch a lot of them in a small area. Big bass often roam the shallows looking for a meal. If you fish shallow water you may not get many bites but you may hook the biggest fish of your life. I caught my first eight pound bass in a January tournament at Jackson lake in the 1970s and a few years later caught my second one weighing over eight pounds, again in a January tournament there. My biggest bass every, a nine pound, seven ounce largemouth, came in a February tournament at Jackson. All three of those fish were caught when the water was very cold, and in all three cases that one bite was the only one I got all day. Fishing eight hours or more for one bite is tiring and frustrating, especially since you may not get even one bite and that one bite could be a smaller fish, but it can be very rewarding if you stick with it. Many folks catch and clean bass and crappie in the winter and are surprised the eggs look like they are ready to be laid. Fish go through annual cycles, too, and those cycles are based more on length of day than anything else, but water temperature does play a part. Since fish are cold blooded their body functions slow way down. That is why they don’t eat much in cold water. So, their eggs need to start developing in the fall and slowly maturing over the winter. That is why fall fishing is so good, the fish are feeding up for the coming winter so their bodies can survive, and the females can develop eggs. By the time the water is warm enough for spawning the eggs must be ready. Since water warms quickly to spawning temperatures, the eggs cannot grow that fast so they must be almost mature. 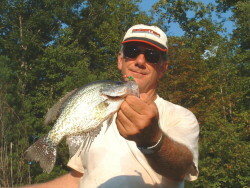 That is why in the winter you may gut a crappie and it be full of eggs that look like they are ready to be laid. They are, they just need a few days of warm water to finish the final process. Cycles of nature are amazing. We have developed the ability to change our environment and do not rely on natural cycles like wildlife and fish. In winter, we can build a fire or produce heat in many other ways. In the heat of summer, we have developed methods to keep our homes comfortable. Wild animals must adapt to the weather, they cannot adept their habitat to make themselves comfortable. Get out and enjoy the outdoors in winter. Just be happy that you can go back inside your warm house when you want to, unlike the animals and fish you have been hunting or catching. This entry was posted in Fishing Ramblings - My Fishing Blog on February 22, 2019 by ronniegarrison. Mystery of World Record Redear Solved? PHOENIX — Have the redear sunfish at Lake Havasu really gone quagga crazy? Have these panfish that really can fill a pan, and are widely regarded as one of the better fish species to eat, found a surplus of invasive quagga mussels to munch? A mystery remains: Redear sunfish at Havasu have been reaching world record sizes. But why, exactly? Let’s dive into this piscatory puzzle. 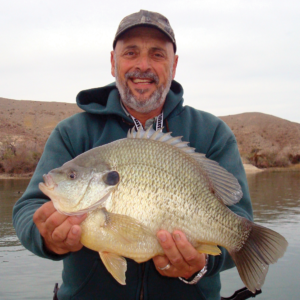 On Feb. 16, 2014, Hector Brito caught a world-record redear sunfish from Lake Havasu. Five years ago, “panfish” took on a new meaning. We’re at the time of year when Lake Havasu tacked its world-record pin on the fishing map. On Feb. 16, 2014, Hector Brito caught a 17-inch, 5.78-pound world-record redear sunfish on a dropshot-rigged nightcrawler. This 45-mile fishing wonderland created by the Colorado River on the western-most strip of Arizona, adorned like a leather belt by the regal London Bridge, allows an angler to fish from the beach on the Arizona side and see the California mountains on the other. Some of those anglers said they witnessed a dramatic increase in the sizes of redear sunfish from 2009-2014 that — coincidence or not — occurred after invasive quagga mussels were first discovered in 2007 at Havasu. In 2014, the U.S. Bureau of Reclamation (BOR) did a study about the effects of redear and bluegill on quagga populations and found these sunfish do consume quaggas. Even more, the redear reduced quagga numbers by as much as 25 percent. The experiments of the study were conducted in field enclosures of Lake Havasu, as well as in the BOR’s Boulder City, Nev. Fish Lab. See the updated report. The Arizona Game and Fish Department can’t verify that redear sunfish, also known as “shellcrackers” because of their pharyngeal teeth (throat teeth) that allow them to crush crustaceans such as snails, are reaching unprecedented sizes due solely to quaggas as an additional food source. Other biological factors include Havasu’s food base of grass shrimp and redswamp crawdads. Regardless, Havasu is home to some of the biggest shellcrackers on the globe. Doug Adams, a former Lake Havasu City-based fisheries biologist for the Bureau of Land Management, said he also knows that redear sunfish eat quagga mussels. At the same time, he said that in 2005 — 2 years before quagga mussels were discovered in Lake Havasu – an electroshocking of 75 sites produced redear sunfish that averaged more than 2 pounds. A mystery it might remain. air of big redear sunfish captured during AZGFD’s November, 2018 survey at Lake Havasu. Ashley’s monster redear sunfish caught during April of 2017 reportedly weighed 5.02 pounds and measured 16 1/2 inches. During AZGFD’s fall, 2016 Havasu survey, the biggest redear sunfish captured (left) was 2.5 pounds.Still, some Arizona anglers have etched their conclusion: The increasingly larger sizes of redear is a quagga-based phenomenon. They don’t call them ‘shellcracker’ for nothing,” he said. “No quagga, then lots of quagga. Regular redears, then big redears after quagga show up … coincidence? Maybe, but I’d say increased food source equals bigger fish. And I have observed that not only do redears feed on quagga mussels, but bluegill and green sunfish do as well. After holding them in a live well for a short period of time, they will regurgitate bits of broken quagga shells until there is a layer approximately a quarter-inch thick in the bottom of the live well. They eat a lot of quagga mussels. Everytime I fish for them, I search their stomachs and always find shells of quagga mussels. A new world record remains possible. “I’m sure there’s a 7-pounder out there somewhere,” said John Galbraith, owner of Bass Tackle Master in Lake Havasu. Perhaps surprising to some, AZGFD has not received a report of a redear that’s come close to challenging the record. Brito said that since his world record, he’s caught some big ones: a 2- and 3-pound redear this year and one last year that weighed nearly 4 pounds. Are you up for a shell-cracking quest? Use the right rig: One of the most popular techniques for catching redear sunfish is using a dropshot rig with a nightcrawler — the same technique Brito used when catching his world record. Brito said he caught the record by the chalk cliffs, and the rig included a No. 8 gold Aberdeen hook. Show a natural presentation: Others use worms on the bottom, without a weight or bobber, and allow the bait to lie motionless. Expect a light bite: Redear bite gently and seem to reject baits that offer resistance such as lead weights. Sometimes, redear will simply move the bait a foot or so like an unsettled shopper. Depth and habitat: At Havasu, when redear are not in shallow water during their typical May/June spawn, they can generally be found in 22-30 feet of water. Redear prefer vegetated areas with submerged stumps and brush with little or no flowing water. Back on the dinner table, redear are widely considered excellent eating. Their diet consists of hard-shelled organisms like clams or snails, as well as insect larvae, planktonic crustaceans and other invertebrates. Stocking redear as a featured sport fish in some locations is a possibility. Yet it’s unlikely the Arizona Game and Fish Department would stock redear sunfish with the sole purpose of reducing populations of the quaggas, which also have affected Lake Mead, Lake Mohave, the Lower Colorado River below Lake Havasu to Mexico, the Central Arizona Project canal, Lake Powell, Lake Pleasant, Canyon Lake, Saguaro Lake, and Red Mountain Lake. Quagga mussels are a poor food source for most other fish species, and drastically reduce food availability for aquatic organisms. This results in smaller catch sizes of other sportfish and native fish species. Quagga mussels may also contribute to increasing occurrences of toxic algae blooms, which can affect both humans and wildlife. Quaggas colonize rapidly on hard surfaces and can ruin boat motors and clog water intake structures such as pipes and screens, thereby impacting pumping capabilities for power and water treatment plants. A 2016 U.S. Bureau of Reclamation report looked at costs related to quagga mussel management on the Hoover, Parker and Davis dams along the Lower Colorado River and found more than $6 million of additional funds were spent through 2016 with an estimated $17 million of ongoing maintenance through 2020. This results in high water and power bills for consumers. When it comes to the smallmouth bass, largemouth bass and redear sunfish, the fishing is at its historic best. The lake continues to be ranked as one of the top places to fish for bass in the country: in 2018, Bassmaster Magazine ranked Havasu as the No. 7 best bass lake in the Western U.S.
Redear sunfish isn’t the only species thriving at Havasu. Largemouth and smallmouth bass are also swimming in luxury. Already in 2019, the average winning daily 5-fish bag weight has been around 21 pounds. Most bass-tournament anglers consider average bags weighing more than 20 pounds impressive. Striped bass fishing also appears to be on the rise. The single-day record for the total weight of striper was set during the annual Lake Havasu Striper Derby during May of 2018: eight stripers totaled 110 pounds, a new one-day record at the 37-year-old tournament. Robert McCulloch Sr., founder of Lake Havasu City, would probably have been proud. At the Lake Havasu City Visitor’s Center, history exits in a binder of newspaper clippings. One of the articles, coated in a hue of rusty yellow, features a black-and-white photo with a shoreline marked by protruding finger- and T-shapes that jet into Lake Havasu. The photo of old Site 6 dominates the cover of the Lake Havasu City Herald, issued Jan. 4, 1968. That’s how it looked when Lake Havasu City founder Robert McCulloch Sr. flew overhead. He would end up purchasing a version of the London Bridge to adorn the Havasu Channel of his city. McCulloch could hardly have imagined how big the redear sunfish have become – nearly 6 pounds, with potential for more. The world-record redear caught in February was not even a spawning fish. Some local anglers believe that a roe-filled spawner will be caught any day. So grab a cup of nightcrawlers, maybe a fishing license online, and a sense of wonder. A new world record could bear your name. This entry was posted in Fishing Tackle on February 21, 2019 by ronniegarrison. Sunday, February 10 only three members of the Flint River Bass Club and one guest showed up to fish our February tournament at Lake Sinclair on a cold, damp day. In eight hours of casting, we managed to land eight bass weighing about 11 pounds. There were no limits, but everyone did catch at least one keeper. Niles Murray continued his winning ways with three bass weighing 3.78 pounds, my two weighing 3.09 was second, Brent Drake placed third with two at 3.07 pounds and guest Mark Hawkins, fishing with Niles, was fourth and had big fish with a 1.92 pounder. Compare that to a tournament the day before. It took five bass weighing more than 19 pounds to win and more than 12 pounds to finish in the top ten. That is amazing. The same lake only one day earlier produced that kind of weights, but we did terrible. There are lots of excuses and I have plenty of them. In the Potato Creek tournament last month on Sinclair I didn’t do well but caught two good keepers and lost one the last hour on one point, so I headed there at 7:30 when we started Sunday. Within a few minutes I landed my biggest keeper on the same crankbait I caught my fish on last month, so I was encouraged. But two hours later, after fishing five different baits there, I had not had another bite. Next, I went to a point that turns into a big flat just off the channel. It has a small patch of hard clay on it where I have won several winter tournaments in the past but got no bites there. I fished another place that usually holds a bass or two around docks, rocks and brush but got no bites there, either. I had checked the Solunar Feeding times on my phone before we started. At times bass seem to get more active on them, and a minor feeding period, the only one during our fishing hours, was starting, so I went back to the point where I caught my first fish. I just knew I would catch something there but was wrong. After more than an hour fishing it nothing hit. I decided to change tactics and went out on the main lake. The first place I stopped I realized the current was running strong down the river, something that often makes the fish feed. I fished that place, a brush pile on a dock, but nothing hit. Current moving on riprap is a good thing, and the bridge in Little River has a lot of released fish on it from tournaments at the marina that restock it every weekend, so I decided to try it. When I stopped, I saw the river current was so strong it was pushing water upstream in Little River, with current going up and under the bridge. It doesn’t matter to the fish which way the current moves, but they do set up and feed in different positions, so I adjusted the way I fished and almost immediately caught my second keeper. Since I had more than three hours left to fish I just knew I could catch some more, but after trying everything I thought might work, I got no bites. That makes for a frustrating day. Everything seem right to catch fish but I either fished the wrong places, used the wrong baits or fished too fast, or too slow. Some days are like that. This entry was posted in Bass Fishing, Tournament Fishing on February 20, 2019 by ronniegarrison. A decade ago, anglers were especially wary of hi-vis braids, preferring camouflage lines to everything else. That’s changed significantly with the success of finesse presentations like the ubiquitous wacky rig, Neko rig, drop shotting, the Ned rig, and countless other fish-catching finesse approaches. For many, hi-vis braid has become an indispensable part of the finesse rig, a way to monitor bites by sight and feel that simply increases hooked and boated bass. One angler who’s made the conversion to hi-vis braid is Mark Zona, bass expert and TV fishing program host. “Here’s what’s funny to me. 10 to 15 years ago a lot of us laughed at hi-vis braid and said, ‘What on Earth do I need this for? I need camouflage!’ Well, that thinking has gone by the wayside with spinning reel finesse fishing applications. It’s critical to have a hi-vis braided line. There’s no stretch in braid, so number one, you have much better sensitivity for bites. Then you add the visual aspect with the lack of stretch and that high level of sensitivity and you’re just putting more odds in your corner to land more fish. From a novice all the way to a professional angler, we look for every edge we can get in bite detection. That’s what this whole game is. If you’re using a braid that’s hard to see or camouflaged with the water with a fluorocarbon leader and you’re struggling to see bites, what you’re doing is absolutely pointless. I now probably apply hi-vis braid and a fluorocarbon leader to 80% of my finesse applications, whether it’s a drop shot, shakey head, etc.,” says Zona. Especially in deeper water, bite detection when fishing finesse presentations becomes critical. Zona knows this well, spending much of his time in what he calls “crazy deep water”—20, 30, 40, 50, all the way down to 60 feet of water, working the bottom with finesse baits. One of the techniques Zona utilizes frequently is called power shotting, which is basically a very heavy drop shot application with ½-ounce to ¾-ounce drop shot weights. But the same applies for drop shotting in all depths, especially when fishing vertically. Even if you’re using a lighter 1/8- to ¼ ounce weight, the sensitivity and visual aspect of a line like Seaguar’s Smackdown Hi-Vis Flash Green and fluorocarbon leader just communicates bites faster than any other line combination can provide. Another deep water finesse application that benefits from hi-vis braid is Zona’s use of a Neko rig, essentially a weighted finesse or stick worm. Same goes when he’s fishing a standard Wacky rig. “One of the things I can tell you, a wacky rig or Neko rig is probably tied on in every single boat across the country, period. And that is one of many applications where Seaguar’s Smackdown Hi-Vis Flash Green has really made a difference. I shot a show recently where I got on a school of bass out deep where I was catching them on a Neko Rig and that line jumps on camera to where the viewer could watch at home and tell I just got a bite! It was that impressive,” says Zona. The Ned rig is another finesse presentation that benefits greatly from a line like Seaguar’s Hi-Vis Flash Green. It allows you to see when your bait is falling through the water column and you can watch when it stops and the bait hits the bottom. Then, as you put a little tension on the line, not only can you feel and see any subtle jerk or sideways motion you can now decipher bottom content. The combination of braid and fluorocarbon leader allows you to tell when that Ned rig bumps into rock or slides through weeds—which is pretty much impossible with an extruded line alone. That is the common aspect in fine-tuning any of your finesse fishing game—the use of a fluorocarbon leader, whether you’re power shotting, drop shotting, fishing a shaky head, wacky rig, Neko rig, Ned rig, small vertical baits like light jigging spoons, etc. A high-quality six to eight-pound fluorocarbon leader is perfect for most applications and you can even get away with 10 given how narrow and clear quality fluorocarbon is. Eight to 10-pound fluorocarbon also gives you a lot more abrasion resistance. Whether you’re using a fluorocarbon like AbrazX or Tatsu it’s important you tie a good knot like a double-uni (aka uni-to-uni), cinch the knot tight and trim the tag ends closely to make movement through the end rod guide easier and necessitate longer casts, which are already 50% or so longer than using monofilament or fluorocarbon sans braid. The diameter is so narrow that there’s little resistance in the guides when you cast it, as well as how smoothly it winds off the spool. And with regards to tying line-to-leader knots like the double-uni, one trick that makes doing so much easier is wetting the end line of the braid, so it has some weight. In terms of leader length, the higher you’re marking the fish in the water column on your sonar, the longer the fluorocarbon leader should be because you want to keep the braid out of their visual range. If bass are one or two feet off the bottom, they’re going to move down and eat stuff off the bottom, but you should have the knot and braid tied to a length that exceeds where they’re sitting. 24-inches or longer is a good place to start. Back to the benefits of hi-vis braid, spooling your spinning reel with a high-visibility line like Seaguar’s Hi-Vis Flash Green also allows you to downsize the action of your rod, making it possible to use something with a little bit softer tip without losing any sensitivity. In fact, combine that rod sensitivity with what the line does and you can literally feel a fish breathe on your bait. The no-stretch characteristic of the hi-vis braid picks also up so much of the hookset that a high-quality rod like a St. Croix in the moderate to moderate fast action is a great match for finesse applications. This combination also delivers more visual information of what your bait is doing, with the line transmitting the wiggle, wobble, and other nuances of how your bait is performing under water, which is then telegraphed through the slightly softer spinning rod tip. Like Zona, more anglers are turning to the use of hi-vis braid to fine tune their finesse fishing game—and for good reason. The other thing to keep in mind is that it’s a switch that not only makes sense in the bass realm but finesse fishing for all manner of fish—panfish, trout, walleye, striped bass, and just about any other freshwater and saltwater species you can think of. The recommendation? Give it a shot this season—you’ll be glad you did. This entry was posted in Bass Fishing, Fishing Information, Fishing Tackle, How To on February 19, 2019 by ronniegarrison. “You don’t know what you got till it’s gone, they paved paradise and put up a parking lot.” That is the refrain from a song that was popular when I was in college. In my 68 years, I have seen way too much loss of what I consider paradise. Last summer I drove around Dearing, Georgia where I grew up. Much of it remained the same but it broke my heart to see places where the change was drastic. The worst was my old home place. The beautiful split-level brick house my parents built in 1962 has a chain link fence in front of it, spoiling its look. Some of the pecan trees, including the one where I built my tree houses, had been cut down. Worse was the field where I spent many happy hours building forts and roasting birds in a big rock pile. Those rocks had been pushed away to expand the field and are no longer available for a kid to enjoy. And the drain where I killed a snipe had been cleared of trees and ditched, removing the swampy area. Dearing Branch on either side of our old farm has been dammed, making pretty ponds but covering the valleys where I hunted and played. I was happy to see the huge oak tree on the hillside where I sat and hunted squirrels was still there overlooking one of the ponds, but all around it were open fields. Some of the old houses where my friends lived had been torn down and replaced with newer ones. Others were remodeled to the point of hardly being recognizable. Worse were the ones that were once the pride of families were so run-down none of folks that I once knew would want to live in them. Dearing Elementary School, where daddy was principal and I attended first through eighth grades, had been closed and changed to a RESA. The lunch room where I loved the food, especially the vegetable soup, was a work shop with boarded up windows and stuff piled outside. The front area looked much the same. The big pines, including the one where I kissed my first girlfriend when in the first grade, was there. But the old ball diamond beside it was now just a pretty lawn. The pine thicket where I almost lost an eye during a pinecone fight looked different without the Jungle Jim and seesaws. The drive from Dearing to Thomson then to Raysville Boat Club, something I did hundreds of times, was also filled with changes. Many of the fields where cows and horses once grazed were filled with houses. Some were very pretty, others reminded me of another song “And they’re all made of ticky tacky and they all look just the same.” The lack of trees around them made them look worse. In Thomson, the old theater where I watched “Godzilla” on a Saturday afternoon and got nightmares for weeks when in elementary school and spent many Friday nights slyly trying to ease my arm around may date, was still open. But a few doors down, the pool hall where I slipped to some afternoons, skipping last period band, was a shop of some kind. No kids would learn to play pool and vastly increase their cuss word vocabulary there any longer. The boat club we joined in 1966 has undergone a lot of changes, too. It hurts to look at the small group of big pines near the water where our camper sat a few feet from the water that are still there. But a ruling by the Corps of Engineers meant removing any structures near the water. I will ever sit on the small porch beside the camper and shoot a deer across the cove. Or just sit drinking coffee and watching the world. Memories of that camper are great but gone. Like the time the lake was three feet high and we pulled our ski boat within a few feet of the deck one afternoon, only to awake the next morning to find the lake at normal level and the boat sitting high and dry. That will never happen again. One of my favorite memories is the Christmas Holidays when I spent at the lake the week from Christmas Day until New Years Day when I had to go back to work. For five days in a row I didn’t see another person. It was just me and my dog. I ate when hungry, slept when sleepy and fished the rest of the time. The lake is way too crowded now for that to ever happen again. All the campers had to be moved further from the lake, and many new ones have been added. The area in front of the club house has campers side by side and the sign there says “Corner of Confusion’” a very appropriate name. And the road into the boat club is no longer wild, with may new campers lining it from the gate to my mobile home. Much of the lake has changed, too. There are not many houses on the water due to Corps rules, but there are more docks. Many of the old stumps and brush piles where I could count on catching a bass have rotted away. But one cedar top I sank on an old road bed in the 1970s is still there and still produces fish. I still love going there but the changes are sad. There is a sense of loss, maybe for my long-gone youth, but also for my dog Merlin, my constant companion from 1974 until 1988 when she had to be put down. And staying there by myself is depressing, remembering the times with my parents. There are just too many ghosts. Change is often good, but some of it is also sad. But making memories like I have are invaluable. Don’t get so busy you miss making them. This entry was posted in Fishing Ramblings - My Fishing Blog on February 18, 2019 by ronniegarrison.